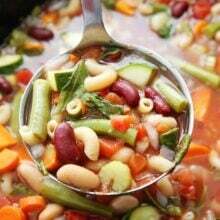 Minestrone Soup is a classic Italian soup that is hearty, healthy, and perfect for lunch or dinner on a cold day. This easy homemade minestrone is a family favorite. Serve the soup with crusty bread and Parmesan Cheese. Today, we are sharing a recipe for Easy Minestrone Soup. 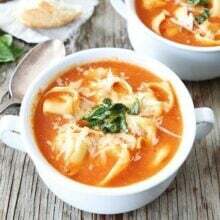 I am excited to share this easy, healthy, and comforting minestrone soup recipe because it is one of my favorite winter time meals. I could eat it every single day. This classic soup is always a favorite meal at our house. 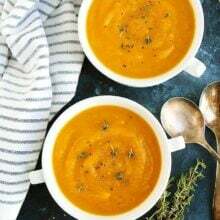 It is the perfect soup for a cold day or any day! You can’t go wrong with this classic soup recipe. Minestrone is an Italian soup that usually includes vegetables, pasta, beans, and sometimes meat. I omitted the meat because I wanted the soup to be vegetarian and honestly, I don’t think it needs it. The soup is super hearty because all of the vegetables, beans, and pasta. Minestrone soup is very versatile. You can add whatever vegetables, beans, and pasta you like. I included carrots, celery, zucchini, tomatoes, and green beans. This is a great soup to make when you need to clean out the vegetable drawer. You could also add in bell peppers, yellow squash, peas, spinach, or kale. I used cannellini beans, which are a white bean. I use canned beans to keep the recipe super simple. You can use great Northern beans or red kidney beans too. I chose whole wheat macaroni for the pasta, but any small pasta will work well in this soup. If you want the soup to be vegan, omit the Parmesan cheese and if you need the soup to be gluten free, you can use gluten-free pasta, rice, or quinoa. I always make a big pot of this easy minestrone soup because it reheats well and we love eating the leftovers. I could eat it for lunch and dinner all week long, and I usually do. It is a great recipe to have on hand durning the cold winter months. 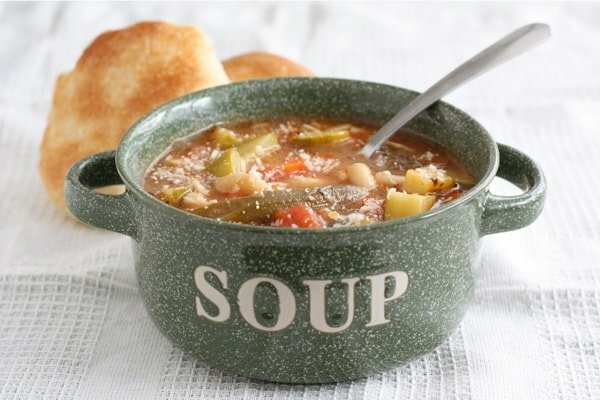 Garnish a steaming bowl of minestrone soup with parmesan cheese and serve with a slice of crusty bread. This easy soup will warm you up and fill you up and it is much better than Olive Garden’s Minestrone Soup:) Enjoy! 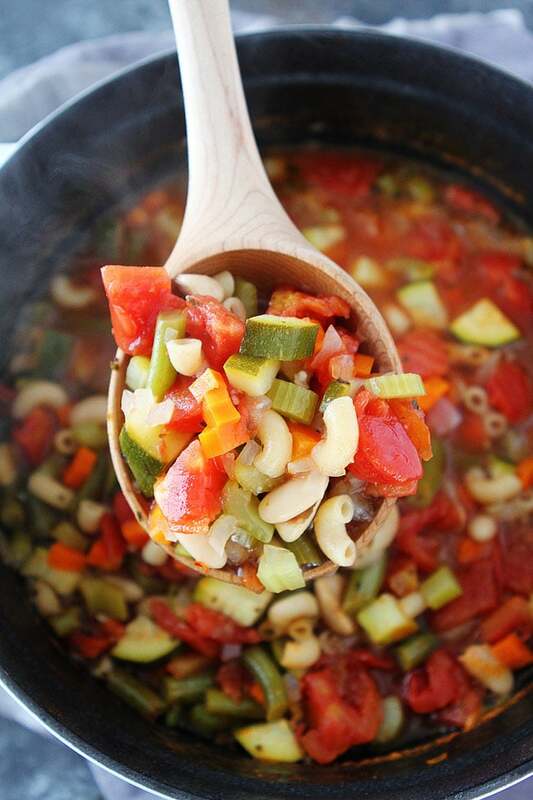 This easy minestrone soup recipe is perfect for a cold day. It is hearty, healthy, and comforting. Serve with crusty bread, if desired. Heat olive oil in a large stockpot. Add onion, garlic, carrot, and celery. Cook for about 5 minutes, or until lightly browned. Add in zucchini, green beans, and diced tomatoes. Stir in vegetable broth, beans, pasta, basil, oregano, and thyme. Simmer until vegetables and macaroni are tender, about 35 minutes. Season soup with salt and pepper and serve warm. Garnish with parmesan cheese, if desired. The cheese on top sold me. Delicious! Keep ’em coming! I love these easy soups during the wintertime. I absolutely love your soup bowl!! This minestrone looks lovely. Great recipe! This looks just perfect for the new year when we’re all a bit cookie-d out 🙂 And it’s certainly nice to know I’m not the only one who does that “make-a-huge-pot-of-soup-want to-eat-it-all-week-long” thing! I need more go-to soup recipes like this, thanks Maria! Do you ever freeze it? The recipe looks fantastic… and that bowl cracks me up!! 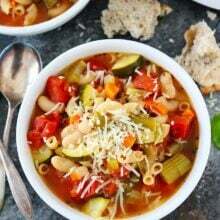 I love minestrone soup, such an easy way to include lots of vegetables. Love your use of whole wheat pasta! This looks incredible! I made a minestrone this week too 🙂 YUM! I always crave soup in January, and I love your little soup crock. So cute! This soup IS easy! It also looks so hearty and delicious. Love your soup bowl, too. Thanks for sharing this, Maria. That bowl is too cute – and the soup looks divine! Looks delicious and that bowl is way cute! Okay, spill the ‘beans’ on where you got the bowl. I got the bowl at a place in Utah called Tai Pan Trading. It’s a fun store! I love minestrone soup – yours looks terrific. Love the bowl too! Not only does it look healthy, it is healthy too! Can’t wait to try it! This soup looks so cozy and warm! I love, love, love minestrone. I always think the more veggies, the better. The last time I made it, I added lentils, which are a nice change from cannellini beans. I love easy soup recipes! I’m making this, this weekend! I am always up for an easy veggie-full soup! This looks terrific. 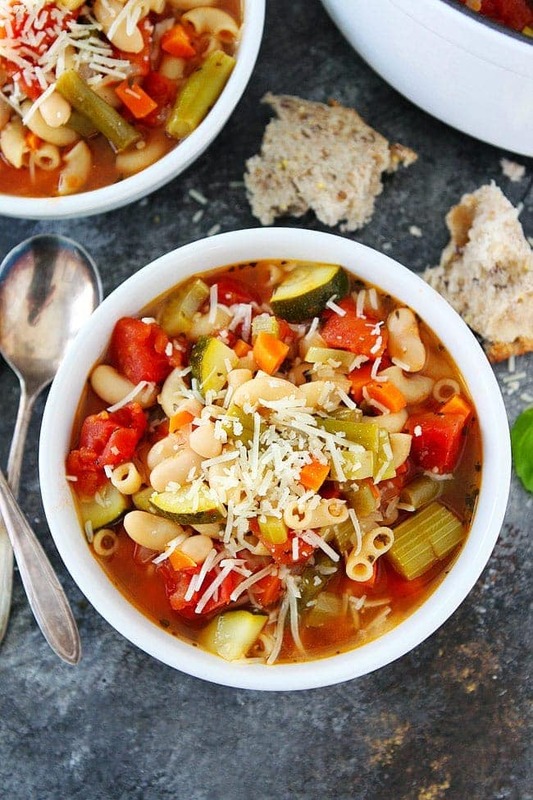 This is right up my alley…I love a good minestrone. Good timing – I’m making minestrone soup tonight! I use the pioneer woman’s roasted vegetable one though. The roasted mushrooms are incredible! make minestrone on a regular basis at Smith Bites – perfect winter soup! It is definitely soup weather here in New York! This looks delicious! I LOVE minestrone! and your soup bowl is SO cute! Beautiful soup…this is great for a chilly snowy weekend here in Manhattan. Thanks for sharing; enjoy your weekend! I am loving this recipe – so simple =) You always think minestrone would be complicated because of all of the ingredients but it doesn’t have to be! Soups right now are key for the hubs and I – I swear we crave it during the winter! P.S. I LOVE those soup bowls!!! We are on a soup kick too! Great meal during the cold winter months! Your soup looks delicious! January is definitely the time for lighter meals after all the decadence of Christmas. I love minestrone soup, why don’t I ever make it? It’s winter and a must make recipe. The soup bowl is so cute! We made this for dinner last night and it was great!! The Hubster is a huge minestrone fan, so I knew he’d enjoy it! The whole family loved it, and it really was super easy! Thanks for the great recipe! Darla-thanks for trying our recipe last night. So glad you enjoyed the soup! Minestrone is one of my favorites! Your bowl of soup looks wonderful! This does look easy! I’ve been sick for a few weeks and have had almost nothing but chicken soup, and this looks like a wonderful way to change things up! I made minestrone soup this week too with zucchini, beans, and corn and I used quinoa instead of noodles. I ate it 5 days in a row. 🙂 YUM! That’s a super easy recipe and just perfect for these cold winter evenings! Oh Minestrone, what a great idea. I have been thinking about making some soup already all weekend and I haven’t made minestrone in ages. Thanks for the inspiration, yours looks delicious! Hi Maria. This sounds amazing! Can you recommend a good brand of vegetable broth? I have been happy with Swanson’s vegetable broth. Mmmm. I LOVE soup. Can’t wait to try this one. Thanks! I’m all about the soup this winter. I love those bowls! Where did you find them Maria? What a lovely soup, it looks so comforting – wish I was enjoying a big bowl right now! I made this tonight and loved it! Thanks for sharing. I love minestrone – there was a little cafe on my college campus that always has the best. It’s a soup I still haven’t made at home; I can’t wait to try your recipe! And I love that soup mug, totally adorable! This soup looks fabulous! Adding it to my must make list as soon as I can get back into the kitchen! What a great, easy soup recipe. With recipes like this, there is not excuse to stop by a fast-food restaurant! Love the changes you made! Glad you liked the soup! I liked your recipe so much that I wrote about it on my blog and linked the recipe! Thanks! I made this for my husband and I was so glad because I LOVED IT! I browned some bacon bits first, then used that grease instead of the olive oil. It makes him happy to have “meat” in his soup. lol. It was deeeeeee-licious!! thank you! I want to make this soup but I don’t really like beans.. is it okay to leave them out? Sure, you can leave out the beans. Found this when I was Googling minestrone recipes. Used it as a jumping off point for making my own. So fabulous! Thanks for sharing! I’ll be checking out some of your other recipes. Glad you found us and glad you liked the soup! YUM!! This was delicious and so easy! I didn’t have fresh green beans on hand so I used canned and it was great. Also added a cup of frozen corn. So delicious on a cold rainy NW day! Thank you! I thought this was delicious, however, next time I’ll add the pasta 10 minutes prior to the simmer being done. The pasta was extremely mushy because it was boiled to death for 35 minutes. Pasta this small should take 7-8 minutes. Where did you get your soup bowls? I love them! and with feta cheese inside is greeeeeat!!! I’ve made this so many times since finding the recipe! Thanks for posting! I made this for dinner tonight. It was really good! Thank you for your recipe. This is delicious! One of my new favorites for fall. I made it as above except used potatoes instead of zucchini (which I don’t particularly care for). With the exception of the celery and garlic, all the veggies came from my garden which made it even better. Minestrone has always been one of those soups I want to like more than I actually like, but not any more! Even my non-vegetarian husband, who was a little skeptical when I served it, really liked it. Thanks! 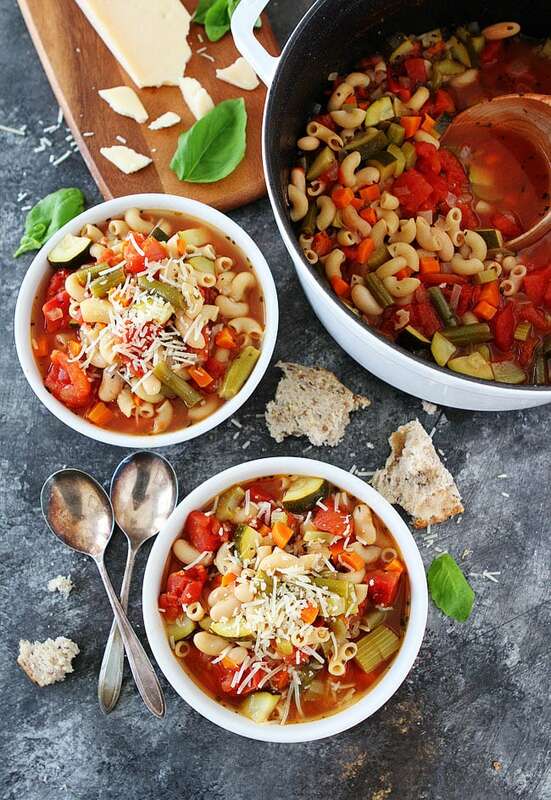 My husband love Minestrone soup but all the other recipes took forever to make them so I would only make it every now and then on the weekend and I was never really a big fan. Well when I found this recipe when he was sick one week to make him feel better it was so fast and so easy and I loved the taste. He really loves the taste as well and has now told me that i have ruined him of all other minestrone soups because this one is always so much better. Thank you so much! This is now one of my go to recipes. Oh good, so happy you liked our recipe! Thank you so much for this recipe. My husband loves minestrone and I’m not a big fan of it normally but I love this one and he says it’s the best minestrone he has ever had. This is the ULTIMATE cure to a cold winter’s day! So easy, quick, and tasty! I used all fresh ingredients since, for once, I actually had fresh herbs on hand. Served with cheeze-it Italian four cheese crackers for lunch. Mmmm. I’m already searching through your other recipes for dinner ideas. Thanks! So happy you liked the soup! Made a big pot of this soup and froze a cup full in a baggie to take to work for lunch. Freezes really good. This was delicious and easy! Will definitely make again! I’m concerned about cooking the pasta for 35 min. Doesn’t that make it too mushy? Thinking of throwing it in for last 6 min or so as the package of pasta indicates. Would this work with Beef broth instead of vegetable broth?